If this at all describes what you want, there is hope. While you cannot control God or your dictate your experience with God, you can “draw near to God” with confidence that God will “draw near to you” (James 4:8). But how does one draw near to God? No matter how distant God may seem at the moment, what has been your personal experience with the presence and love of God in the past? If you think back to the many significant moments or turning points in your life, what could you point to as evidence of God’s activity? When have you felt God’s touch? In the Magnificat, Mary celebrates in song what God was doing for her and would do for all of humanity through her son Jesus. 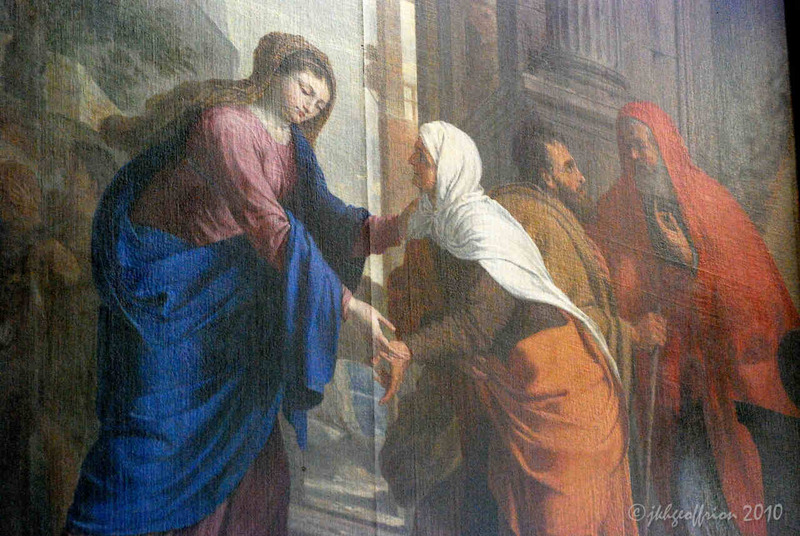 At the time of the “Visitation” at the home of Elizabeth, Mary sings about the great works of God—not ideas about God, but the concrete actions of God. In reflecting on her experience with God, she is filled with joy and praise, perceiving the love of God in her life. When I look at my past through the eyes of faith, I can see how the Holy Spirit has worked through many significant events, people, and circumstances to shape who I am and my relationship with God. I meet someone special, take an incredible class, experience a great success or devastating tragedy, discover something profound or powerful in Scripture, use my talents in ways that open my eyes to meaning and purpose in my life, or make a critical decision with far-reaching consequences. Each experience then joins a whole train of other significant life-changing moments, which together become my testimony of God’s work in my life. While anyone can point to noteworthy “chance” encounters or “coincidences” that have altered their life significantly, when you look at your life through the eyes of faith, you will see God at work. Then, not only will you think differently, you will feel differently as well. Why? Because as you let the Holy Spirit open your eyes to the truth of God’s love and activity in your life in the past, you will be experiencing the Holy Spirit in the present. And, with Mary, the more you sense that you are truly blessed, the more you will have your own song to sing. When you look back over your life so far, what in your experience suggests to you that God knows who you are, cares about you, and is in fact at work in your life for good purposes? The Point: To move from simply knowing about God to experiencing the presence and love of God more personally in your life, you need to create enough space to let the Holy Spirit speak to you. Start by taking some time alone to look back on your life. Pray for eyes to see the many different ways God has been at work in your past experience, so that you may be better able to see and feel God in the present. 1 Many of the ideas from this article are discussed at greater length in One Step at a Time: A Pilgrim’s Guide to Spirit-Led Living, pp. 126-129. © Timothy C. Geoffrion, 2010. All rights reserved. Please share this article with as many people as possible, with proper acknowledgment of authorship and web-address. Photo: © Jill K.H. Geoffrion. To sign up to receive a personal email every time a new article is posted, please email me at tim.geoffrion@fhlglobal.org. Simply write “add me” in the subject line.